The dismissal of yours truly and the chain reaction that followed is perhaps one of the most infamous college dismissals. It is certainly one of the most frustrating. Over the years after that fateful Thursday morning, a suspect confessed and recanted several times. But as of February 7, 2019, the IWU cold case is solved 906 weeks to the day of the dis-enrollment. In the early fall of 2001 the Zinn family was living the American dream. I was an 18 year old newlywed man graduated from Mississinewa High School. 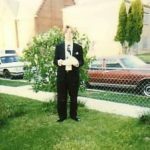 My mother was in failing health and was getting worse from emotional abuse from my step-grandfather and my brother was soon to learn that he was beginning a career as an automotive mechanic at Leroy’s Automotive Service on the west side of Marion. In the fall of 2001, yours truly Aeverine “Ava” Zinn (then known as Frank) was a typical 18-year-old college boy whose life revolved around media and education. I lived with my mother, Margaret, my brother, Albert, and to a lesser extent, my newlywed common law wife, Angie, 22, in a comfortable three bedroom home on North Branson Street in the near northeast side of Marion. The household also consisted with my youngest nephew (Albert’s boy), Baxter, turning 3 that October, and my now-transgendered daughter, Tiffani (then Timothy), aged 22 months. September 27, 2001 started like any other fall morning for the Zinn’s. My mother, Margaret, planned her day over a cup of coffee. Yours truly, went to college as usual just sixteen days after the horrific tragedy of 9/11. Angie was helping Albert getting prepared for his new job at Leroy’s, while Baxter and Tiffani were watched TV on the family couch. Angie was heading to the gym, but needed to run a few errands before going to her doctor’s appointment. Angie fed Tiffani a hot dog and go out for a walk while watching the news. Rushed for time, Angie let it go. And besides, it was unusually mild, in the low 60’s already. Angie, Albert, and I got into what was considered to be the family car, a tan 1981 Ford F-150, and took off to run errands. At the time there were family issues with my step-grandfather (and eventually was revealed to be Rick Renbarger and Vicki Little) who had effectively killed my mother and brother three months apart. After dropping off yours truly at IWU, Albert drove to the Marsh store in the Panamora Plaza, to see about some items they had on sale. Anige entered the store and walked past the customer service desk and entered the grocery department. It was around 9:00 a.m. There was a tons of construction at the Indiana Wesleyan University Student Center which lacked a Commuter’s Lounge (and I exposed this, but did not say anything until 2019). Also hampering were family budget trouble, which did not help matters. This eventually took a fatal toll on my mother. Only an hour after I entered the campus of IWU, I had an appointment with Jennie Conrad at 10:00 that morning. The discussion turned to be fateful Ms. Conrad and I had with Jerry Harrel, who was the Student Services Director at the time, had informed me that “I was suspended from the college until further notice.” I was thinking “Oh my! ” Knowing my family, they believe that may have been too embarrassed to say anything just minutes later. Whatever the reason, I was now a dis-enrolled student unable to carry out for what Ms. Conrad says “the normal routine of campus life” and unsure what to do next, quite possibly would lead to find another college to attend. A search that would take nearly 20 years to at least resolve once and for all. Seventeen years (906 weeks or 6,343 days), a gender (and sexual orientation) transition from a heterosexual male to a lesbian female, a Housing Policy change at IWU and a relocation later, I finally have the answers. Only hours after I was dis-enrolled from Indiana Wesleyan University, my search for another college to attend that September morning has grown into an 18-year search for answers. On September 27, 2001, I launched what is still considered today the largest and perhaps the longest search for another college to attend in Grant County history. But six months as Ivy Tech Community College came in to the picture, the harsh reality set in. Mindful of the fact that Ivy Tech could help get me readmitted to IWU, the I went to Karen Stockton, a therapist/counselor at Cornerstone at the time (now a therapist at IU Methodist as of 2010) after Vance Maloney eventually became no help at all by June of 2002. No reasonable resolution was offered and the case was going cold. On May 10, 2002, my mother passed from liver and kidney failure. Three months later, on August 10, 2002, my brother took his own life at Pine Lake in Berne, Indiana. A few weeks later, around Thanksgiving, Angie discovered she was pregnant. Tabitha Ellen Zinn was born to Ava (then Frank) and Angie on March 27, 2003 and died on July 18, 2018. On August 12, 2002, I had an appointment at the Community Support Program with Dr. Jerry Co (a medical psychologist at the time) and I remember stating to him, “I’m okay but not okay.” It wasn’t even 48 hours after my brother’s suicide. I knew at that time things was only getting worse and it was coming. By September 2002, I had just lost custody of Tiffani. I realized at that point it was the start of a long, complicated, and frustrating battle that lead to more problems than resolutions down the road that would eventually do years of overall damage of which I may never recover from. Shoddy treatment and Representative Payee Abuse plus very little progress, in particular, a cable television dispute in 2008, a disorderly conduct detainment in 2015, a back injury 2017, and a burglary 2018, all played mitigating factors to the eventual relocation from Marion to Fort Wayne. Confessions and leads from key individuals and A Break? Over two years went by with little progress on finding another college or university. I was getting nowhere and trying to get my life back on track. Then two individuals I went to school with Blake Pattison and Megan Stone (the last individuals to have seen me before I transitioned to female) gave me some information that would eventually lead to an unrelated case being solved nearly nine years and a gender transition later. It was the beginning of a whole new emotional roller coaster. On May 11, 2002, the Chronicle-Tribune, reported Rick Renbarger (one of my cousins at the time) was arrested for child molestation and on May 6, 2002, another cousin of mine, Carol, had died of cancer. At the time, Vicki Little, who had a nasty history of harassment, and Rick Renbarger, in a way, confessed to the murder of my mother and caused my brother’s suicide. The story Little gave that night is what would lead the Zinn family to announce a few days later, that they had their prime suspect. Over the years, Vicki Little confessed and recanted time and again to the IWU dis-enrollment of yours truly in 2001. To this day she, along with Rick Renbarger and to a lesser extent, Vance Maloney are confirmed suspects. Investigators noted that LIttle’s harassment was consistent with my findings. There was no mistaking that Little knew details of the person who caused my-dis-enrollment. © 2010 – 2019, https:. All rights reserved.